I have been a big street art fan for a while, but recently I have started to appreciate the value of taking a street art tour. I learned so much during my Brooklyn Graffiti and Street Art Tour and the tour I took of Philadelphia’s Mural Mile. 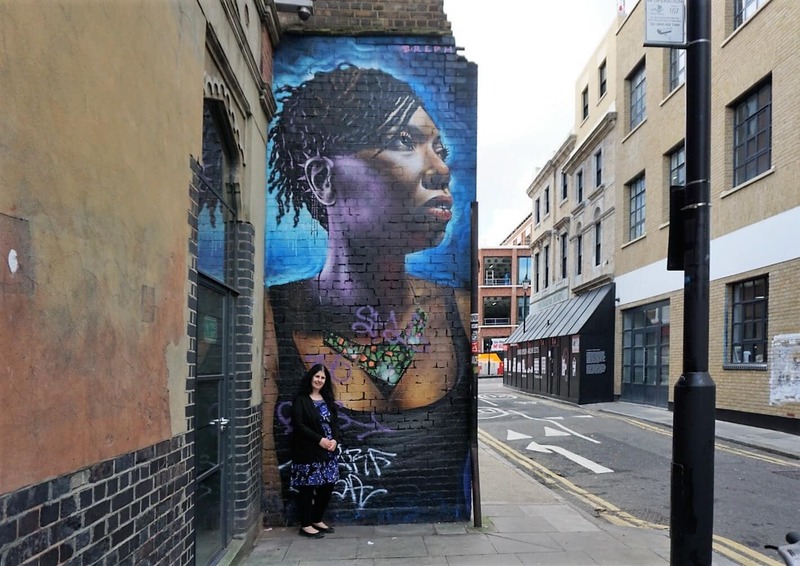 Thanks to my cousin, Hassan, I had seen some of the street art in Shoreditch before and knew that it was one of the best areas in London for street art. 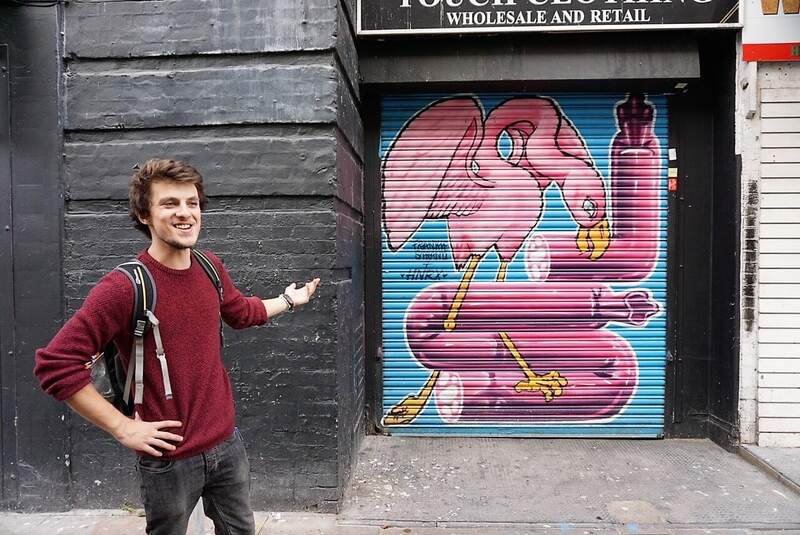 When I learned that you could take a free Shoreditch Street Art Tour with Strawberry Tours, I couldn’t wait to go! 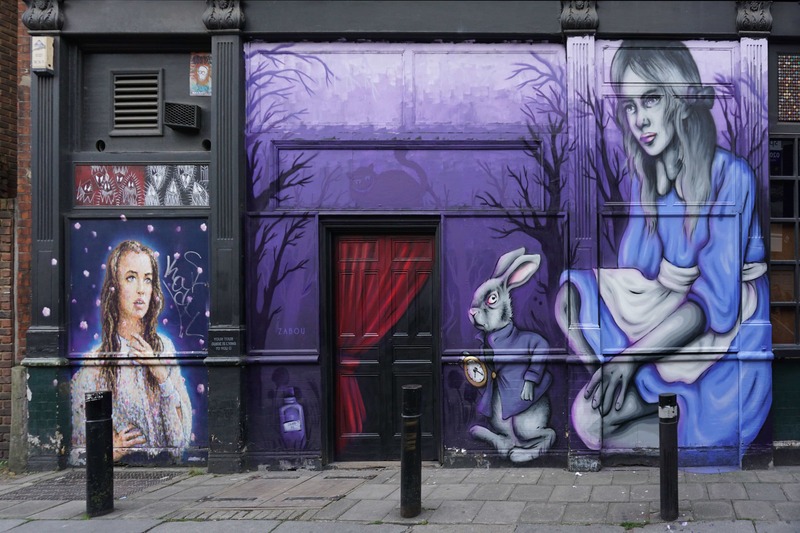 This Alice in Wonderland Mural by Zabou was Russell’s favorite. Strawberry Tours offer various tours in London for free! They just ask that you tip your tour guide the amount you feel the tour was worth. If you don’t enjoy the tour (which won’t be the case! ), you don’t have to pay anything. Part of this money does go to cover marketing and operational expenses. The guides also donate 10% of the tips to charity. My friends, Kristin and Pete, who now live in Denver were in London, so we decided to bring them along on the Free Street Art and Graffiti Tour. While the tour is free, you do need to make a reservation online. You will get an email confirmation, but you don’t need to print it. They offer the tour Tuesday, Thursday, Friday, Saturday, and Sunday at 3:30 pm and recently added an additional tour at 11 am on Saturdays due to popular demand. 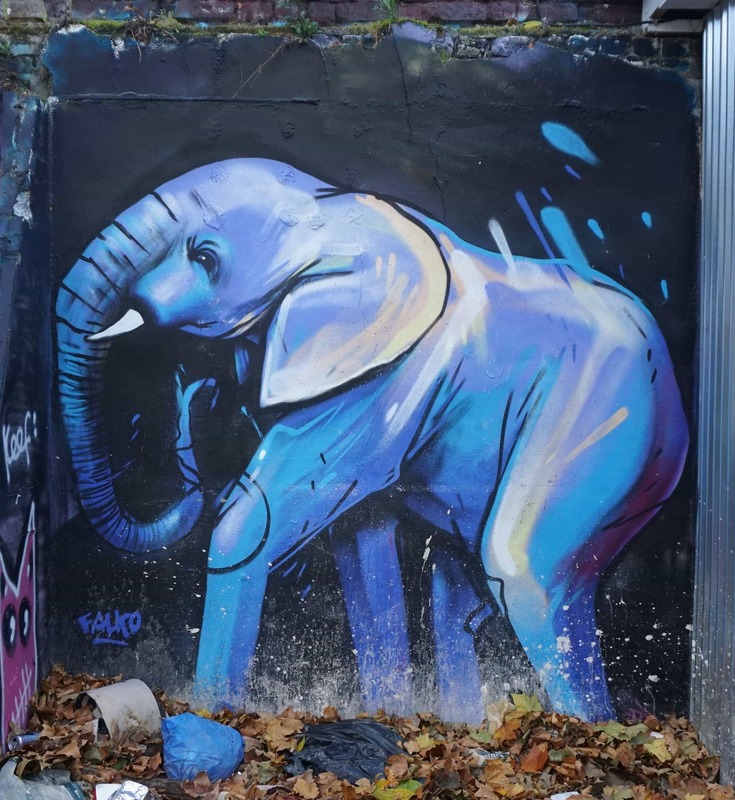 The street artisit, Falko One, loves to paint elephants! We saw several on our Shoreditch Street Art Tour. You meet in East London at the Tower Hill Underground Station by the coffee stand called “Tower Hill Tram” and look for the strawberry umbrella. We had no problem finding it as there were a group of people already waiting. I didn’t realize this is also the meeting place for a few other tours that Strawberry Tours runs too. Once our tour guide Nathan arrived, we checked in with him and a few minutes later the tour took off. It was a pretty large group, but I guess that is what I should have expected on a free tour. There were also a few kids, so this could be a great option if you are looking for a kid-friendly London attraction. Nathan did a great job keeping everyone together and we never had any issues hearing what he was saying. It was sometimes difficult to get pictures of the street art without someone in the way. We stopped just outside the old London City walls and Nathan talked to us a bit about the history of street art. As Nathan pointed out, street art dates all the way back to the cave paintings. That was something I hadn’t thought of before! I also thought it was interesting that he pointed out that most of the cave art was done by women while the men were out hunting. It was a way to say that they were they there. One of a series of murals that Jasper did of black and white animals. Similarly, many prisoners were also artists and did carvings on the walls to show that they existed. I remember how moving the graffiti we saw in the Tower of London and Edinburgh castle was. I didn’t think about it in the same light as street art then but I can see the connection. He also explained to us that street art is technically illegal in the UK. Some areas, like Shoreditch, choose not to crack down on it but a lot of street art gets done secretly at night. Nathan did mention that on one of his tours he ran into the street artist, This One, painting a mural. Unfortunately, we didn’t see any street artists during our Shoreditch graffiti tour, but you never know. Street art can be very anti-establishment! 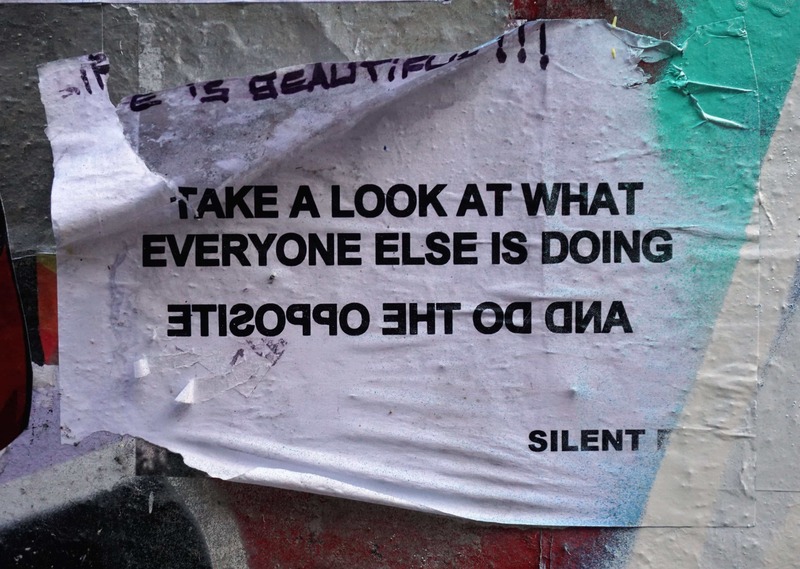 In a lot of cases, street art has been an anti-establishment response. We saw several pieces on our Shoreditch walking tour that fit that mold. Although, as Nathan pointed out, street art is now becoming more and more commercialized. For examples, some businesses have hired street artists to make announcements. While some street artists have commercialized their work, other street artists are upset with the trend. The Shoreditch area is definitely well-known for its street art. I loved seeing the different styles of street artists in Shoreditch. For example, ROA painted beautiful black and white animals with so much detail. Nathan told us that he would do his work all in the dark. You would look at some of the Shoreditch art and wonder how he got up there to paint that. Anisa with one of the portraits from Dreph’s “You are Enough” campaign. I also liked Dreph’s “You are enough” campaign, a series of portraits across London paying tribute to his friends who are doing amazing things. We saw two of the paintings during our tour. One was a portrait of the mother of Dreph’s children. Both of his portraits that we saw were so colorful yet so realistic and powerful. Nathan suggested that the best way to tell the quality of the street art is to look at the eyes. The eyes can portray so much emotion. This struck me and I think this is why I just loved Lexi Bella’s work in Brooklyn. I am amazed at the how the eyes in artwork can say so much. If you look closely you can see Jimmy C’s drip painting technique. Jimmy C is an artist with a different signature style, called drip painting, where he paints entirely using spots of spray paint. If you stand back the dots form impressive paintings. The technique reminds me of Seurat, who painted A Sunday Afternoon on the Island of La Grande Jatte, one of my favorite paintings. We saw two murals by Jimmy C on our Shoreditch Walking tour. The murals in the Star Yard were just amazing, this is just a sample. The highlight of the tour for me was Star Yard. If we had been exploring the area on our own, we would have probably totally missed it. There is a small alleyway off of Brick Lane (between Fashion St. and Fournier St.) that leads to the courtyard/parking area. I was so impressed by all the Shoreditch art here. The large murals were so colorful and there was a lot of smaller more political pieces, mixed in with the graffiti in Shoreditch, that you need to look at closely to fully appreciate. We actually went back to the Star Yard after our tour because we wanted to spend more time seeing the artwork and also get pictures with less people. Nathan shows us some of the smaller pieces of street art in the alley leading to the Star Yard. During our street art tour, Nathan also pointed out a few examples of hidden street art like a little painting on a street sign. He showed us one where someone had painted a little figure on it. We also saw some other examples of hidden street art, you would have to do a double take to tell whether it was a real sign or street art. Our Shoreditch Street Art Tour Group photo courtesy of Strawberry Tours. Do you see us in the back? We saw a few more of the Brick Lane art murals and then it was time for our group picture. Nathan told us he would email it to those of us that had provided our email addresses. The picture turned out great. I thought that was a nice touch. 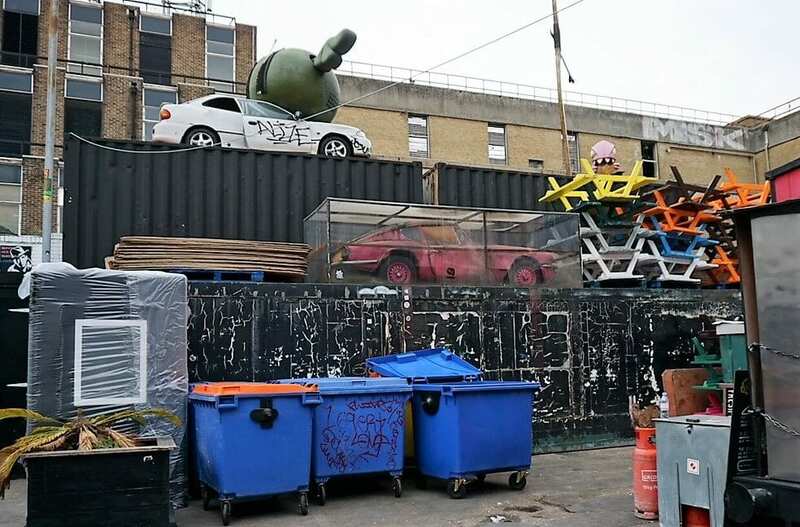 Banksy’s Pink Car is kept under plexiglass. We ended our tour by the Truman Brewery where we saw a piece by Banksy. It was a car that has been painted pink. Not the most exciting of Banksy’s work, but a Banksy nonetheless! Unfortunately now they had to place plexiglass around it to protect it from graffiti. Note: Depending on the guide, your Shoreditch art tour may end in another location. Some of the other artwork we saw were from famous street artists including Jasper Goodall, Zabou, This One, Ronzo, Ben Eine, Shok-1, Mr Cenz, HNRX and more. HNRX’s work seemed to be everywhere you looked. Some were stickers on lamp posts and I saw lots of his murals. He had a unique style and as Nathan said there was always some sausage like object in his paintings. Not sure I got his work, but it was visually appealing. Unfortunately, we saw plenty of Shoreditch graffiti too. HNRX has an interesting style, it was easy to spot his work. There is so much amazing street art to see in Shoreditch, it is not possible to see it all in one tour! Plus, the street art in London is changing all the time. Our East End Street Art tour lasted 2 hours and it was definitely time well spent. 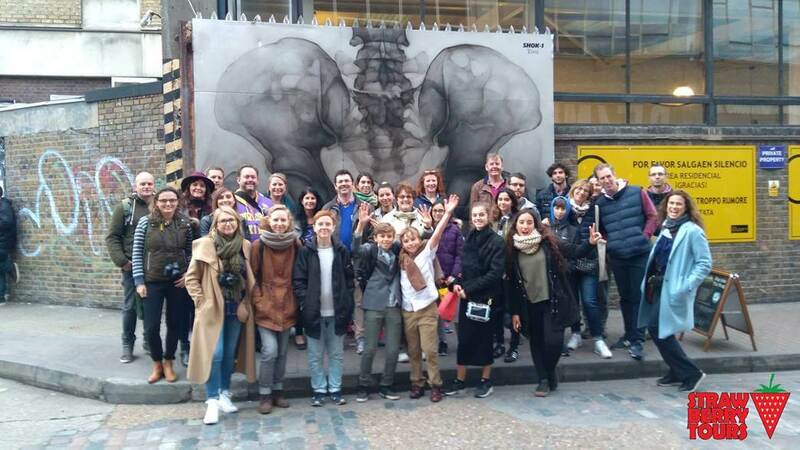 A Shoreditch walking tour is the best way to see and learn about the art. You can check out our video to get a better idea of what our experience was like. 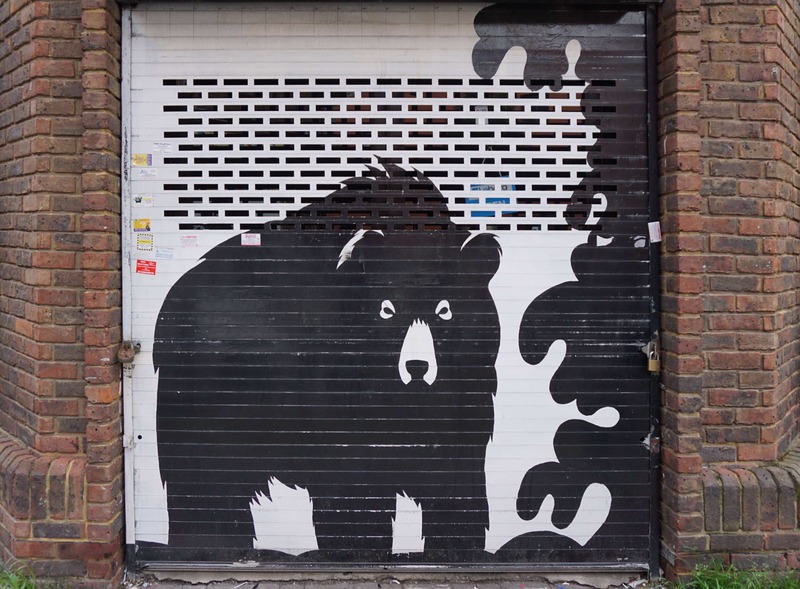 Have you seen the street art in Shoreditch? What are some of your favorite artists or murals? Reserve your spot in advance online for your free Strawberry Tour. Make sure you also look for the hidden street art and smaller pieces – they are impressive too! While you are in the area, be sure to check out some of the best restaurants in Shoreditch. We are happy to co-host the Weekly Postcard Linkup. Everyone is invited to join us and share their travel blog posts here beginning at 12 p.m. (PST) / 8 p.m. (GMT) Friday, November 17th. NextBest Gifts for Travel Enthusiasts Like Me! 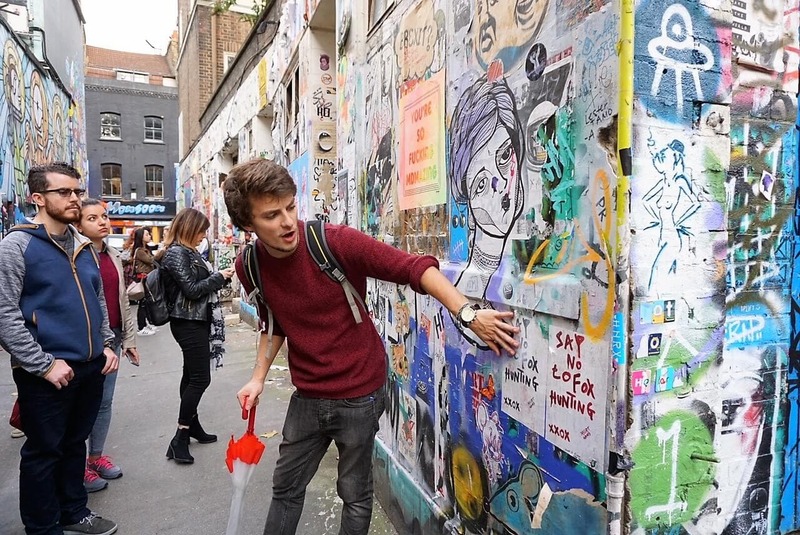 Totally agree – I think a street art tour is the best way to experience street art! So often they’re hidden in little nooks and crannies that you might miss if you didn’t know exactly what to look for. And I like the explanation of the motivation behind some of the works – not exactly readily available information! Sounds like a great tour, honestly. Pinned for next time! Michelle – I hope you get the chance to do the tour! We really learned a lot in the 2 hours, there is so much to see in Shoreditch. This really makes me miss living in London. We were there four years before quitting our jobs to come travelling. The artwork in Shoreditch is so colourful and there’s so much new stuff here in your blog that I didn’t see! Thanks so much for sharing. Vicky – Thank you. The artwork is always changing so its hard to keep up even if you were living in London. How great. Did you mention how many miles it covered? My city has some great street art but it is not dense enough to lend itself to a walking tour. Staci – Thank you. I’m actually not sure how far we walked because my fitbit ran out of battery. We did do a fair bit of walking though. I would love to go this tour since I’m mildly obsessed with street art lately!! The drip art is very cool too. I think I’d learn about from a tour since most of my knowledge is minimal. Love this! Thanks Julie! You would really love this tour, I hope you get the chance to do it. Unta – If you love street art, you will love Shoreditch! Wow amazing arts. I love street arts so creative. Madhu – Thank you. So glad to hear you like the artwork. Thanks for the heads up. Sounds like a great tour, and well worth a trip down to London for that alone. I’m intrigued by the drip painting too. Bernie – So glad to hear you want to do the tour! The drip painting is really impressive, especially up close. Everyone has told me I need to visit Shoreditch, and I’ve always kinda pushed it aside, but I absolutely love street art, and I think this was the post to push me to go! It looks like it has a great vibe! Anya- You really should visit Shoreditch. I am glad this post has convinced you. I definitely want to hear what you think after you go. Really love this! I really would like to do this free street art tour. It seems like an adventure and you can see soo much beautiful street art. Sanne – Thanks so much. I hope you get a chance to take the tour. Lolo – Thank you! The Alice in Wonderland was my husband’s favorite too. Keri – Haha! Yes, you really should see the art in Shoreditch, it is quite impressive. We love street art also, and recently took a tour in San Francisco :). This looks awesome. I hate that I missed it when we were in London this past summer. Guess I’ll just have to go back! Michelle – I would love to do a street art tour in San Francisco! I know the Mission area has some great murals. What a dream for street art lovers! I particularly like the “You are enough” campaign mural 🙂 Shoreditch has such a cool vibe, pretty similar to the atmosphere in Bushwick, NYC! Audrey – So glad you enjoyed it. Yes, I do think the area is similar to Bushwick, both have amazing street art. Ruth – Thanks. I did do a street art tour in Brooklyn but it wasn’t free. It was still a great experience and I learned a lot and saw art I probably wouldn’t have otherwise seen. I am a big fan of street art too, Anisa, but unfortunately I’ve only experienced it through other people’s eye so far. Somehow, I never seem to come across any when I travel. I probably don’t know where to find it. The only place I’ve seen some was in Dresden, but it wasn’t even by far as interesting as the one you saw in Shoreditch. Now that you live in Europe, I’m sure you are going to encounter even more. I wonder if street art is still illegal, because in the past it was. Anda – I really think you should do a street art tour, you would love it. And yes technically street art is illegal in the UK, but some areas (like Shoreditch) choose not to enforce it. I love street art too and have never heard of this tour so it’s great to be able to add to my list of things to do on my next visit. 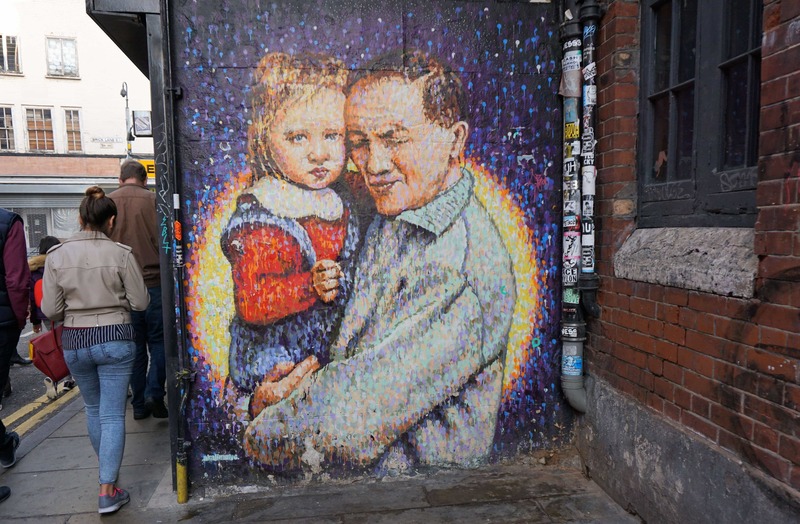 Lisa – If you love street art, then I would definitely recommend trying to take this tour. What a great way to find all the hidden gems of street art. Sally – Thanks, glad you liked it. I also love street art! The “you are enough” campaign is amazing! Didn’t realize London had so much cool street art! Cherene – Glad to hear you like it too! London does have amazing street art. I want to see more of it. Hilary – You will love it. Let me know if you have any other questions when you are planning your trip. I have spent a fair bit of time in London. The best things when travelling on a budget are free! Shoreditch is such a funky area, I loved hanging out there where all the shops and markets are held and of course the murals are amazing. You have certainly found some gems! Kreete – I really love the Shoreditch area too!